Rural roads and bridges are essential for accessibility and connectivity within any state. 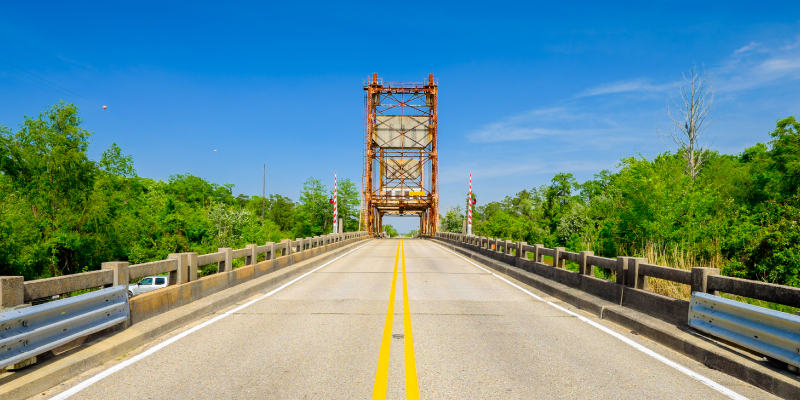 Louisiana is no different, with small towns and communities throughout the state relying on these roads and bridges to connect them and contribute to local economies. This network of small towns and communities, linked through Louisiana’s rural roads and bridges, plays a key role in the economic input and workforce that these small towns provide for Louisiana’s larger cities. In 2017, The Road Improvement Program (TRIP) evaluated all 50 U.S. states on a set of criteria intended to rate the structural integrity of their rural roads and bridges. According to the report, Louisiana ranks 9th in the nation in structurally deficient rural bridges. On top of this, 18 percent of the state’s rural roads are rated in poor condition, the 17th highest in the nation. Another 20 percent of the state’s roads are rated in mediocre condition. Industries such as the energy and agriculture sector rely heavily on rural transportation networks in order to move goods to consumers. The state of rural Louisiana roads and bridges hinders these industries from performing as efficiently as they could. The effects of the structurally deficient rural infrastructure in Louisiana are not just economic. In 2017 alone, there were 316 rural non-interstate traffic deaths. The state of rural roads and bridges heavily affects all aspects of life in Louisiana. Until a plan is made to fix Louisiana roads, reports such as the one presented by TRIP will continue to worsen.